Wingshooting has been my lifelong passion and the motivation that has resulted in my occupation which runs the whole gambit of wingshooting worldwide. I have worked for several of the top gunmakers in England and Europe as shooting instructor, gun fitter, gunmaker and sporting agent (outfitter). The knowledge I have acquired has created other opportunities as an author, writer and television presenter. My enthusiasm for wingshooting has taken me and my guests to the finest destinations on three continents and in fourteen countries. But, of course, the origins of and the very best of driven wingshooting are in Britain and Europe. The above was not written to brag or bolster my own ego, but to outline my experience and add weight to the following: in October of last season I was lucky enough to be invited to shoot at the La Cuesta Estate in the Villanueva de los Infantes area of La Mancha and there experienced some of the very, very best driven partridge shooting that I have ever encountered in Spain. However, a trip to Spain is not all about shooting. It is a chance to enjoy the combination of Spain’s rich historical and cultural activities, its artistic vitality, mild temperatures, clear skies, and, of course, the food and wine! All of this bounty adds up to make a shooting experience that is truly unique and second to none. Spain is the second largest country in Western Europe with over 194,878 square miles of land and a great variety of geography, weather and cultures. 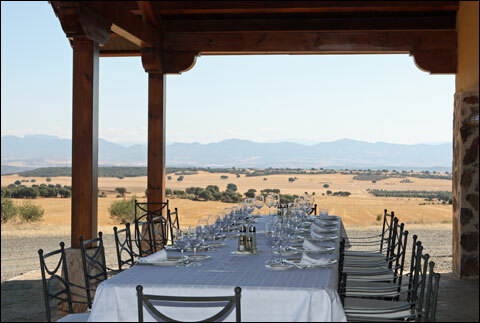 The La Cuesta Estate is located on the Iberian Peninsula – an area that has been contested for throughout history. The influence of those different races and cultures (the Romans, Iberians and Moors) has created the modern Spain of today – a country with a rich variety of traditions and customs, and a people who have a genuine warmth and love of life and family. 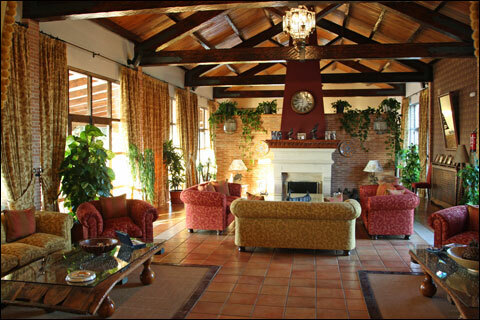 The comfortable lounge area of the La Cuesta Estate. The rural villages that dot the countryside are connected by a network of highways and railways which lead to the larger cities. While over 15 million people live in the major cities, the lightly populated countryside seems to remain untouched. As in previous decades, traditional occupations abound and raising livestock and arable farming are still the mainstays of these regions. Spain, without a doubt, has one of the best climates in Europe, but like its history and culture, the weather patterns can be diverse. Mountainous regions in the North have extremes of temperature, while the Costa del Sol offers consistently endless blue skies and sunshine. Looking down on Madrid from the plane as you approach, you see the urban sprawl of streetscapes divided by a rich, green tapestry of manicured parks and open spaces threaded by the river Manzanares. Madrid is a vibrant city full of warmth, welcome and history. It would be a shame not to extend your visit and spend a day or two exploring this, one of the great cities of Europe, before or after the shoot. On arrival, after clearing baggage and customs, the representative from Davis & Bowring is there to greet you and simplify the shotgun handling process. You then board an executive coach for the three hour drive to La Cuesta in the province of Ciudad Real, deep in the rural countryside. The scenic drive from Madrid is made all the more pleasant by a midday break for lunch at an historical and beautifully wood-paneled restaurant in the Royal City of Aranjuez, built in 1380. Suitably refreshed, you continue your journey to the lodge, driving through the “La Mancha,” region of Spain. It was almost impossible to look at the landscape without thinking of Miguel de Cervantes’ romantic hero, Don Quixote, fencing with the windmills. The scenery matches Cervantes’ description of the region; every hill seems to be crowned by a castellated tower, set against a perfectly blue sky with clouds as soft as cotton drifting aimlessly by. 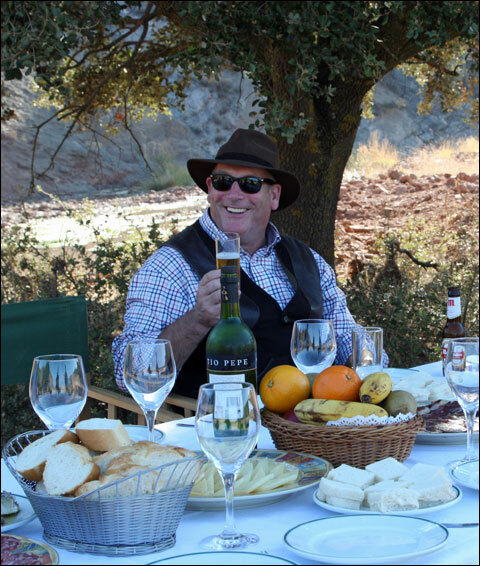 But if you are as passionate about good wine as good shooting, you will be as keen as I was to sample the fine wines for which the La Mancha region is famous. This is not only Spain’s largest wine region it is the largest wine region in the world. But most important, the La Mancha doesn’t get much rain because the whole area in encircled by mountains. With cold winters and hot summers, the weather is not only perfect for growing grapes but it is also perfect for rearing partridges. The drive to the truly Five Star Finca Cuesta de la Borracha is through a rolling countryside of tilled fields interspersed with olive groves and dotted with oak trees. And most surprising and delightful, throughout the weekend, across the estate, the vehicles’ passage disturbed covey after covey of feeding wild partridge! The superb lodging is set in a manicured, stone-walled estate with majestic views across meadows and valleys, to the foothills of the distant mountains. The word “magnificent” does not do it justice. The combination of location, tranquility and the warm, sunny Valdepeñas climate creates the most idyllic welcome imaginable. This warm welcome is continued by the house staff assembled to greet the arriving guests as rooms are allocated, bags delivered and shotguns placed in the armory. The staff at La Cuesta offers superlative service and attended to our every need throughout our stay. The Spanish traditionally dine later than most Americans are used to, around 9:30 PM. The evening repast begins with cocktails and tapas, followed by a gourmet dinner served al-fresco on the patio. Here the guests can take advantage of the warm October evenings and the view looking out across the moonlit landscape to the foothills and star back-dropped mountains, zebra- shadowed in black and indigo. The table setting for the afternoon meal provides a spectacular a vista. The following morning you will be pleasantly surprised by the laissez-faire pace of shooting in Spain. There is no urgency, and breakfast is a leisurely affair and more than ample time to complete one’s ablutions before choosing pegs and meeting your loaders and secretarios. Once the introductions have been made, you board the fleet of four by fours for the journey across the estate. It is a steady climb into the foothills as the convoy makes its way through vast rolling fields and meadows sprinkled with holm oaks to the first drive. This relaxed start sets the pace for the rest of the day. Many of you may have been used to the “hurry up” attitude of most shoot captains in Britain, created by the pressure of winter daylight saving. 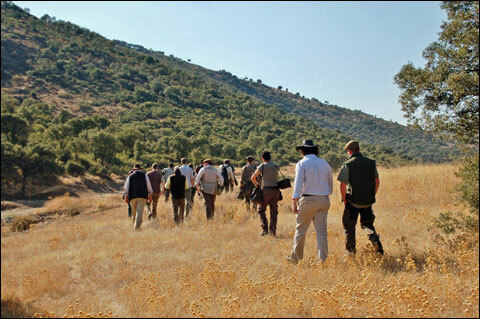 You will find the Spanish-style is a refreshing and comfortable pace at which to enjoy a day in the field. At your destination you will be greeted by the backstage staff of beaters and your loaders and secretarios. A short walk takes you down into a steep sided valley, where you follow the course of a small babbling brook to reach your pegs. There are many different practices that you have to become accustomed to; your “peg” is actually a blind made of rush matting. Your loader sits on stool in front of you and when in action, takes the empty gun from you and offers up the number two gun from this position. They are amazingly dexterous and efficient, you will never be without a loaded gun, no matter how fast and furious the action. One of the guns on a peg at La Cuesta Estate accompanied by a secretario. The secretario’s role is to sit behind you and mark your killed birds. 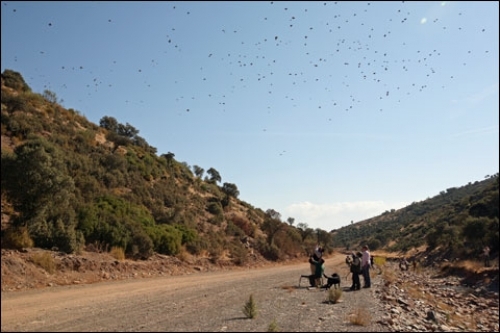 He records the number and position on a piece of paper, and at the end of every drive you are individually told the number of birds shot and cartridges used. This is quite unlike in England, where a bag is divided equally among the guns and the UK peg system is designed to spread the shooting evenly, but if you are out of the shooting, there is no recompense. In Spain, each in the line of guns pays individually, by the bird, to an agreed daily total bag, usually 600 for the team, i.e., the guns only pay for what they actually shoot. Your host at La Cuesta is Jesús Alberto Muela, and he is not only the host, but also the Shoot Captain. He positions himself on the high bluff opposite the drive, where he can observe the beating line. From here, he manages the beaters by radio, directing them so that all of the guns enjoy a good supply of birds over them. It is easy to feel that this task is redundant, as there are so many partridge in a drive and the shooting is very high volume over the length and breadth of the line, but this is no accident. When truly wild partridge are being driven, the team of beaters needs an experienced captain to orchestrate their efforts to ensure the success of each and every drive. Jesús Alberto has a lifetime of experience in rearing and showing high, spectacular partridge and the first drive we shot was the proof in the pudding that he really knows his job. “Fantastic” sums it up! On your peg, looking up over a steep escarpment of lichen-covered rock, a riot of brush in hues of buff and tan gently slopes away from a field of scrub oak and bushes to a powder blue sky with unmoving puffs of cotton-wool clouds. When the first partridge explodes from cover into the air, wings a-blur, powering high overhead, it is just the first covey of these aerial acrobats. In tighter formations they begin to pour over the line. As the first retorts are heard, evasive action is taken, the partridge sliding and turning, but never taking their foot off the pedal as they zoom overhead. Due to their height and speed, the odds favor the partridge and that, after all, is what every true sportsman desires. The line is now a cacophony of shots and shouts, with partridge folding and tumbling from the air to fall far behind the line. This is very different from the classic Spanish partridge drive where birds are driven from flat or undulating land, and fly at medium heights of 10 to 15 yards – this is more like the high driven pheasant in Devon, passing the guns at 30 to 50 yards and higher. The sight of these little grey rockets blasting over the valley, 40 plus yards above the guns, with coveys bursting like shrapnel from a hand grenade over the line in every direction, results in extremely challenging and exciting shooting - it really gets your heart pumping! It is easy to get carried away and attempt to shoot every bird crossing the line within range, if the whole team keep this up, it can mean an early end to the day. The secret is to be selective, choosing only the highest and most challenging of birds to maximize the experience. The problem with this strategy at La Cuesta is that all the partridge are very high and very fast! This is one of the top shoots in Spain, if not the whole of Europe and its reputation for high, testing partridge is well-earned. You will need to be on the top of your game and everything must be just right to come to grips with these grey winged rockets. When the first drive reaches its climax and the flow of birds turns from a torrent to a trickle, the line of beaters begin to appear along the contour of the escarpment, shouting and waving their flags. Pickers-up and a whole fleet of Spaniels, Pointers and Labradors “Hoover-up” the fallen game. Your secretario gives you the number of birds you shot and cartridges required to do so. This can be a triumphant or humbling ratio! This result of the instant tallying at the end of each drive can be seen on the faces of the guns – either broad grins or pained frowns. The author relaxing after a glorious day of driven partridge shooting at La Cuesta Estate. As the adrenaline seeps away from the first drive, it is so nice to fall back into the leisurely rhythm of the day. On returning to the shoot transport, you discover that a table has been laid with an array of tapas - assorted Spanish delicacies of breads, cheeses, Iberian jamon, anchovies, olives and nuts - accompanied by various “aiming fluids and swing lubricators” – chilled white sherry, vino tinto and tankards of beer – all served by a steward in white jacket and gloves – a very refreshing and welcome experience indeed. The third drive is followed by lunch and if I have described the pace of the day as languid, well, for lunch it stalled completely. This is the “high bar” of shoot lunches! Dining is “al fresco”, at a table laid for eighteen (in case the non-shooting ladies would like to join us) complete with fine linen, cut glass and silverware. This, all shaded by an awning, positioned on the edge of a high hill offering an incredible view across the valley below. Chefs have been cooking all morning and the result is a Spanish feast with several courses of barbecued meats and vegetables –a la parrilla – accompanied by excellent local wines. It is little wonder that, as is the Spanish custom, a siesta should follow this sumptuous repast. But as the wind strengthened, in the afternoon drives the birds found a higher altitude from which to tease and test the guns. But by now the line were old hands and raised their game to match the gauntlet thrown. On the last drive of the day with the light just beginning to fade and the cloud cover thickening, I delighted in watching one of the best drives ever. I know the old saying, “They are never as high as they look”, but these birds looked out of range. As no one had mentioned this to the guns, they plucked them from the sky, the birds seeming to fall forever before hitting terra firma with a thud, fifty and sixty yards behind the line -truly awesome shooting! Driving back to the Finca my fellow guns dozed around me, energy spent and running on empty, such was the excitement of the day’s drives. This gave me a chance to reflect on and savor the extraordinary shooting and fuelled my anticipation of the fantastic sporting experience the coming days would provide. The wonderful thing about Spain is that their season is open when the UK season is closed. Longer days and milder weather, the warmth of the Spanish people, the excellent food and wine added to the absolutely fantastic shooting, combine to create the most perfect partridge shoots. Jesús Alberto Muela Ayala, his family and staff, have created without a doubt, one of the very finest wingshooting experiences in the world. I have to say “Viva a La Cuesta”! 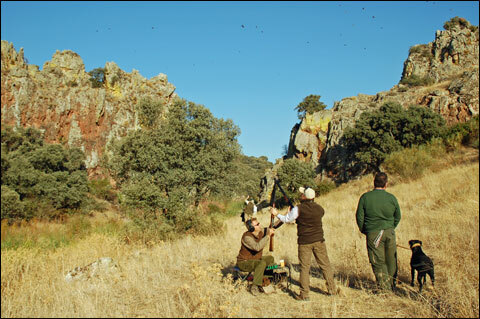 If you would like to experience the driven partridge shoot of a lifetime, shoot at La Cuesta. Chris Batha is considered to be one the highest qualified Shooting Instructors in the world today. He has more than 30 years experience coaching, wingshooting and competition clays shooting and a life-long passion for fine guns. Mr. Batha conducts Shooting Schools at some of the finest Shooting Facilities in The United States as well as in Great Britain and Europe, averaging 18 different locations each year. He also organizes instructional and recreational wingshooting trips to the finest destinations in Europe, Africa, South America and the USA. He is a frequent contributor to leading magazines and is author off the highly acclaimed book “Breaking Clays – Target Tactics, Tips & Techniques.” He is also featured in the DVDs “Take Your Best Shot” and “Mastering the Double Gun” by Sunrise Productions. For more information about Mr. Batha, please visit his web site at http://www.chrisbatha.com. Chris Batha is considered to be one the highest qualified Shooting Instructors in the world today. He has more than 30 years experience coaching, wingshooting and competition clays shooting and a life-long passion for fine guns. Mr. Batha conducts Shooting Schools at some of the finest Shooting Facilities in The United States as well as in Great Britain and Europe, averaging 18 different locations each year. He also organizes instructional and recreational wingshooting trips to the finest destinations in Europe, Africa, South America and the USA. He is a frequent contributor to leading magazines and is author off the highly acclaimed book “Breaking Clays – Target Tactics, Tips & Techniques.” He is also featured in the DVDs “Take Your Best Shot” and “Mastering the Double Gun” by Sunrise Productions.